Asana is a web-based task management, project tracking and collaboration software. Its main objective is to help teams basically know who among its team members is doing what tasks to be completed by when. As such, the availability of these important information to all throughout the whole project cycle makes it easy for people to focus on their work. Moreover, the software is simple for users to start quickly, with features that allows for daily task prioritizing, project information search and monitoring, real-time updates and more. 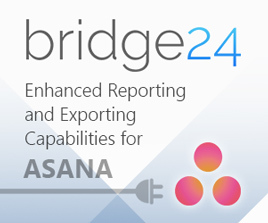 If you are searching for a powerful extension to Asana, we suggest trying out our own Bridge24 for Asana. Task and Project Management – Asana enables teams to manage and control their projects from conception, to implementation, to completion. Users can create tasks and assign to one or more members. Thus, the whole team knows who is responsible for the task. They can see the big picture by organizing tasks into lists or boards. Users can assign due dates on tasks with the option to see them in a calendar view. Also, they can attach files relevant to their work from their computer or from online storage. Real-time Communication – A shared workspace allows users to add comments to a task for questions, clarifications or suggestions. Real-time communication minimizes the need for time-consuming meetings, but instead allows for immediate response. Entire teams can hold project discussions through the system regardless of their geographical location. Furthermore, users can collaborate with external partners, vendors and contractors easily with the platform. Multiple Views, Customizations, Integrations, and more – Asana helps users see the information they need with different available views. Users can prioritize tasks in a list, get important updates through a smarter inbox, and check progress with a customizable dashboard. Also, users can easily search and filter from all the information. They can also find a file attachment with a gallery view. Premium features also include custom fields, admin controls and priority support. Integrations are also available with many 3rd party applications as well as mobile device support. Asana is free for teams up to 15 people. The free plan includes for unlimited tasks, projects and conversations. This plan also includes basic dashboards. The Premium plan starts at $5 per member/month. Smaller teams automatically get a lower price. The Premium plan does not have team member limit. It also includes unlimited dashboards and guests, custom fields, task dependencies, advanced search, admin controls, data export and more. Asana is for individuals, teams, startups, SMBs, large enterprises, and non-profit organizations. It is beneficial to companies and businesses in many industries such as IT, software, agencies and others with a need for task management, project tracking and real-time communication requirements. Clients include Uber, Airbnb, IDEO, Pinterest, NASA, Dropbox, Abercombie & Fitch, and BBC Worldwide. Darren Tome at Mashable stated that Asana helps them get work done. Moreover, it also allows them to see a complete history of what teams and vendors all have done together and how they did it. Stuart Frye at Udacity recalled that they suddenly understood timing, blockers and obstacles in their projects when they used Asana. They do not have to send emails back and forth anymore, so it completely changed the way they work as a team. Asana is a productivity tool that enables teams to see information about work and projects immediately and in different perspectives. Its design is simple, it is easy to use, yet customizable and can quickly integrate with other 3rd party applications. Together with built-in communication and organizational tools, users are provided clarity, transparency and focus that help them collaborate easily and produce great results. Asana, Inc., is a private Internet software company with headquarters in San Francisco, CA and offices in New York City, USA and Dublin, Ireland. It was founded in 2009 by Dustin Moskovitz and Justin Rosenstein. The founders built an internal project management and collaboration tool while they were working at Facebook. They saw how the tool changed for the better the way the people at the company coordinates. They then realized its potential and decided to make the technology available commercially to help other organizations. The company has received several rounds of funding from investors. Indeed, Asana continues with its mission of helping humanity thrive by enabling teams to work together effortlessly.